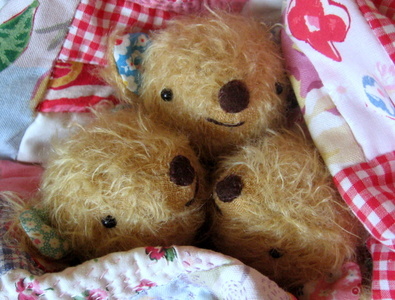 Oooh cuteness in triplicate!!! Why are you soooo clever lady!!!!??? Aw those triplets are adorable. How productive you are! I think you meant to say three incredibly adorable over-the-top cute things. Although, that would be a kind of long title. Oh for Pete's sake. I cannot stand it. All three of those pictures make me so jealous. Your talent is amazing and wonderful!! ...and your photography/set design is great, too! Wow, you've certainly given us lots of Easter treats on which to feast our eyes! Little Fifi and her nest are beautiful, the birdie and egg are so sweet and the triplets, well - it's a picture to look at any time you need to be enveloped by a warm fuzzy glow! I love visiting here - I always go away with a smile! Have a fun Easter. Gorgeous x 3! Can't wait for tutorial. Have a good weekend too and thanks for such lovely photos. That is the cutest stuff ever Lynn! 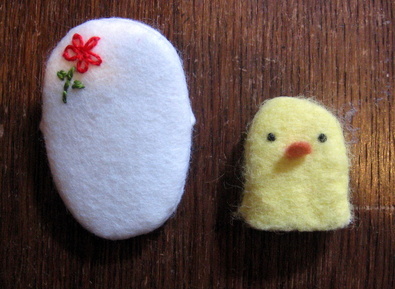 You know I have a penchant for chickens and your little chickadee is fabulous! triplets? you are just too amazing. I love the expressions on all your little ones. Those triblets are soooooo cute! It's *all* so delicious and edible!!!!! Awwww..... these are the cutest creatures I've ever seen!! They are all so cute, I'm in love! Awww...precious. Just want to snuggle up with the little Fifi or the Triblets. 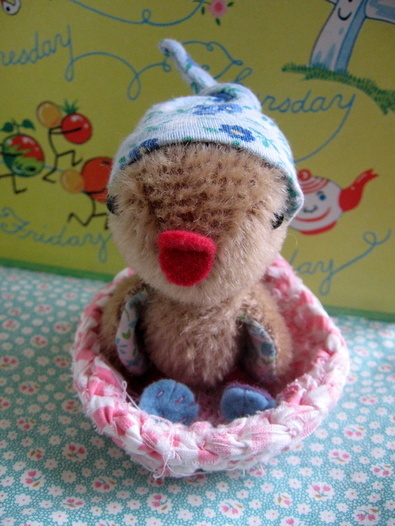 Love Fifi's hat - it reminds me of the tiny baby hats that the hospital put on my newborns. cute as always. i really like the nest! a great idea! Oh, I love all the lovelies you have been working on!! Can't wait for the tutorial, if only I had the time and organization to actually do them!! How is it the a picture--your triplets---has the ability to change my mood in just a glance?!?!? So darn adorable,,,,in their cuddly little setting all close together. Every little bit full of charm...thanks for sharing. OMG! The trouble with triblets - they're too,TOO cute. The CUTENESS on this post alone could power a Wonka chocolate factory for a week - powerful WIP's! ohhhhhh too cute! those little teddies are too adorable and love fifi!!!! its all cute! They are all amazing, but the bears are over the top. I especially love the ear fabric. Where did you get the fabric for the fur? Eeeekkkk!! Each one is so stinkin cute I could just die of sweet cuteness overload--that is, I really love them and can't stop squealing ;-) You have a wonderful gift! Fantastic. Wonderful as ever. I can't wait to see what comes out of this week! loving the triblets and fifi's little nest. you done it again missy. Awe, I wanna cuddle w/all of 'em! Too cute!! I love the Triblets!! So cute! lovelies triplets ! I like it !!!! très très joli blog, merci pour toutes ces belles choses!!! oh my goodness, what cute little faces on the Triblets. Oh gosh- I know I'm responding to an old post, but I've only just found you. But I had to say something, because my daughter calls them "triblets" too - and it totally cracks me up!